We’re still a little over a month away from seeing what will take place in the second half of The Walking Dead Season 6, but now we can start anticipating the debut of companion series Fear the Walking Dead Season 2, as it will be premiering a lot sooner than we expected. Madison and Travis will re-enter our lives on Sunday, April 10, more than four months earlier than its Season 1 premiere date. As well, the release dates for Turn Season 3 and the miniseries The Night Manager were also revealed. For fans of the horror drama, this is undoubtedly good news, as it means more of the year will be spent watching zombies wreck shop across certain areas of the U.S. Considering there are more episodes in Season 2 than the six-episode run of Season 1, it totally makes sense that it would be premiering earlier than late summer, but I still didn’t expect it to pop up until June at the earliest, so that it could end right around the time The Walking Dead Season 7 kicked off. I even thought the network might decide to air them back-to-back on the same night, but I guess it’s better to spread the wealth. The fact that it’ll be going up against Game of Thrones, which premieres two weeks later, will likely play a huge role in the ratings it brings in. Release date news wasn’t the only new thing to come out of Fear the Walking Dead today, as the very first Season 2 image was also set afloat. Check it out below. The Season 1 finale ended at the coastal home of Victor Strand, whom we will see more of in Season 2, and the narrative will see the core survivors heading out to sea on Strand’s yacht. That plan probably won’t be too successful in the long run, but at least Travis and Daniel look relatively calm in the image, so it’ll probably take at least a few minutes for things to go haywire. Aside from the more gory fare, AMC viewers can also look forward to seeing Tom Hiddleston and Hugh Laurie going head to head in the six-part miniseries The Night Manager, which will debut on Tuesday, April 19 (at 10:00 p.m. ET), for the network’s first foray into Tuesday night originals. The next week will bring the Season 3 premiere of the war-bound drama Turn: Washington’s Spies, which will debut on Monday, April 25, at 10:00 p.m. ET. 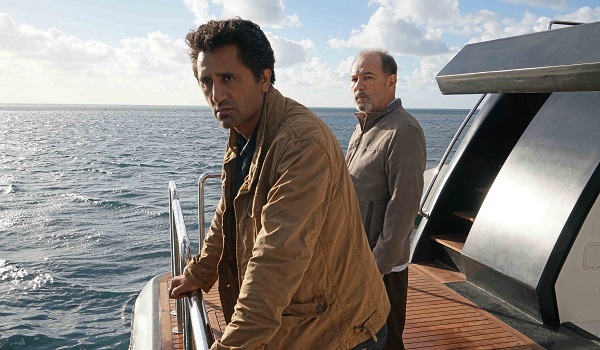 So to reiterate, we can look forward to spending the spring with Fear the Walking Dead Season 2, which will debut on AMC on Sunday, April 10, at 9:00 p.m. ET. The Night Manager will be the next premiere on Tuesday, April 19, with Season 3 of Turn debuting on Monday, April 25. To see when everything else will be premiering and returning in the next few months, check out our midseason TV schedule.